It's been 25 days since I planted the Jonathan Green Dense Shade and 9 days since I planted the Jonathan Green Black Beauty grass seeds in containers indoors. The Black Beauty is doing much better than the Dense Shade as can be seen from the photo on the left. Black Beauty is on top. 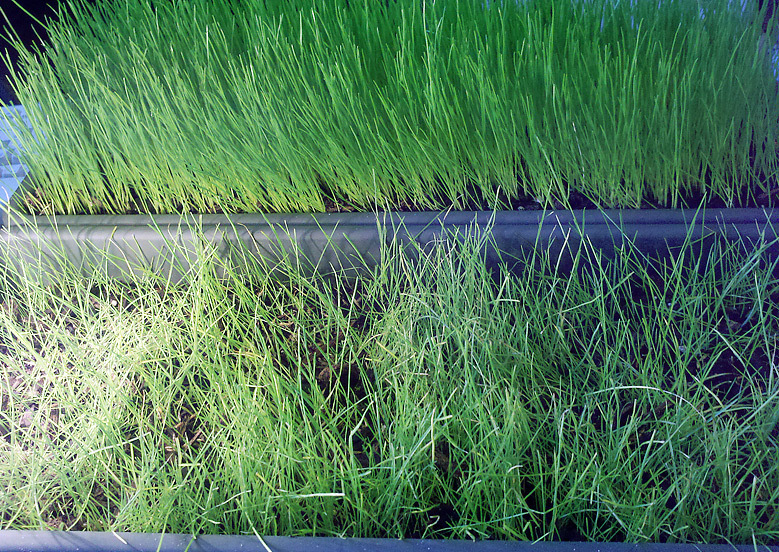 The Black Beauty stand almost reminds me of the decorative wheatgrass that is more commonly grown indoors. The Dense Shade had a lot going against it. First I used seed that was a few years old but I did manage to get pretty good germination by putting a lot more seed down than recommended. There were some thin spots and I added more seed as well as more potting mix to raise the level of the soil because it had compressed a bit after watering. Over the past few days the new seeds have begun sprouting. Next, I noticed an infestation of bugs in the Dense Shade container. After doing some research I determined they were likely fungus gnats. You can see a cool video of neem oil killing the fungus gnats and their larvae. The bugs appear to have stunted the growth of the grass. 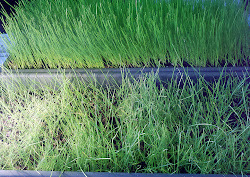 The new seeds are doing well but if the old grass doesn't recover it's just not going to look good. The Black Beauty grass has been doing much better although when the Dense Shade was 10 days old it was looking pretty good too. I used fresh seed for the Black Beauty and it germinated a lot better and I have good coverage with no bare spots unlike Dense Shade. There are still Black Beauty seeds germinating. 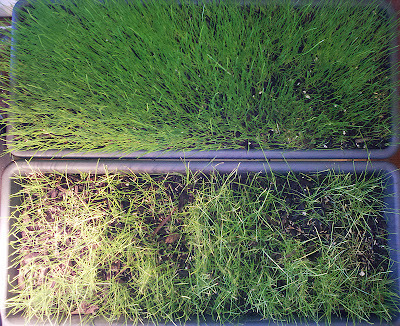 The grass is also standing upright while the Dense Shade has slumped over. The Black Beauty is about 3" tall. In a couple of days I'm going to have to give it it's first mowing. Both containers are getting some indirect light from north facing windows plus some additional light from the room lights. That seems to be enough. So far Black Beauty appears to be more shade tolerant than I thought. Jonathan Green Claims Black Beauty contains endophytes which help make it more insect resistant. When I noticed the fungus gnats infesting the Dense Shade container I didn't see any in the Black Beauty container but I don't know for sure if the endophytes were the reason why. The main reason I started the Black Beauty was to see how thick the blades get. Right now the blades still have a very fine texture but I can see they're begging to get a little wider. So far it's looking like it might be a good choice for my lawn renovation. 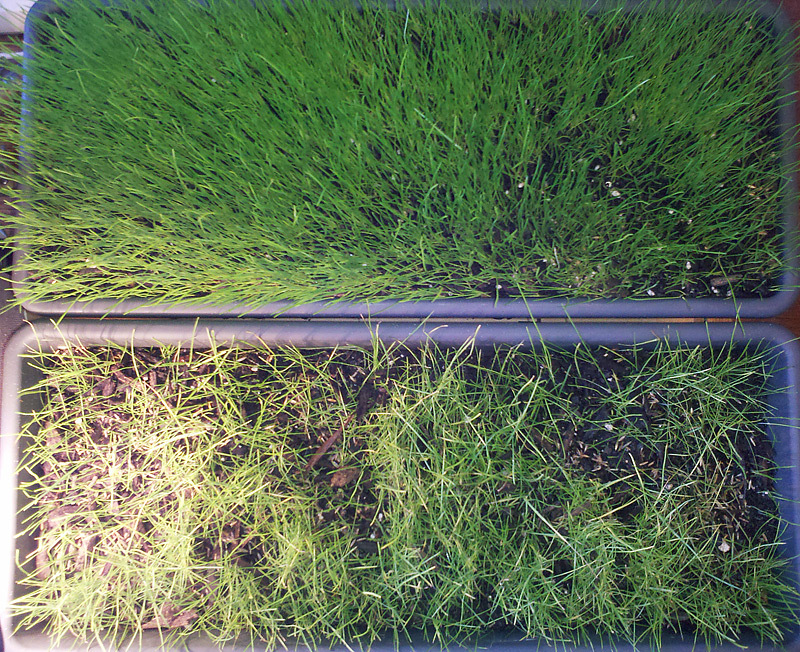 Here's a top view of both grass containers. Black Beauty is on the right, Dense Shade is on the left.